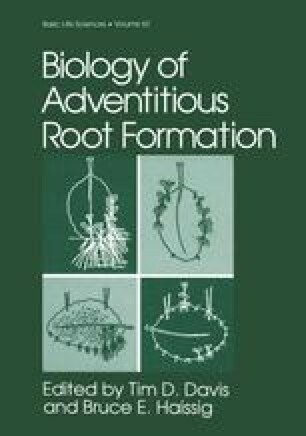 Carbon allocation to roots is of widespread and increasing interest due to a growing appreciation of the importance of root processes to whole-plant physiology and plant productivity. Carbon (C) allocation commonly refers to the distribution of C among plant organs (e.g., leaves, stems, roots); however, the term also applies to functional categories within organs such as defense, injury, repair and storage (Mooney, 1972). It also includes C consumed by roots in maintenance respiration and nutrient uptake (Lambers, 1987). In this paper we will use the terms “C allocation,” “C partitioning,” and “component biomass accumulation” (i.e., leaf, stem and root biomass) according to the process-based definitions of Dickson (1989), and Isebrands and Dickson (1991). C allocation is the process of distribution of C within the plant to different parts (i.e., source to “sink”). C partitioning is the process of C flow into and among different chemical fractions (i.e., different molecules, different storage and transport pools). Biomass component accumulation is the end product of the process of C accumulation at a specific sink. In the present review, allocation, partitioning and distribution will be relative terms (e.g., percent of total), whereas growth and accumulation will reflect absolute size (e.g., dry weight, moles of C, etc. ).